The Reivers were romanticised by Sir Walter Scott, who gave them ‘the spit-and -polish treatment’ and a ‘romantic bearing and heroic stature.’ Robson also sheds light on the derivation of words, such as ‘reiver’: a ‘reef” in Old English meant a line, a Shire Reeve was a man who protected boundaries, thus the reiver raided across the Border Line. ‘Blackmail’ has two possible derivations – greenmail was agricultural rent and blackmail was money taken at night, or protection money. Alternatively it could be that it came from the fact that the reivers blacked their armour to ride as shadows in the moonlight (page 49). I prefer the alternative derivation. Then I moved north of the Border Line into Scotland with my reading and finished Ian Rankin’s book The Falls, a book I first read a couple of years ago. I wrote about it at the time and I haven’t much to add to that post. The Falls combines so much of what I like to read – a puzzling mystery, convincing characters, well described locations, historical connections and a strong plot full of tension and pace. Rebus has morphed in my mind into a combination of the actors who’ve played him – John Hannah and Ken Stott – and his creator Ian Rankin. But there is no doubt that the books are far superior to the TV productions. The next Rebus book I’ll be reading is Resurrection Men. Last week whilst staying with our son in Scotland we visited Rosslyn Chapel. The chapel was founded in 1446 and is still used today as a place of worship. I first came across Rosslyn Chapel through reading Dan Brown’s The Da Vinci Code and was fascinated by it then. I never thought I’d actually visit it as we live so far away, but when I discovered through reading Ian Rankin’s The Falls that it is just a few miles south of Edinburgh and only a short distance from where our son is living we decided to go. It’s well worth a visit on its own merits (forget about Dan Brown’s book) if you get the chance. It’s simply the most stunning building, packed with stone carvings. It was a cold windy day, but there were quite few other people there too, and I imagine it would be packed during the summer months. I was surprised at how big the Chapel is, from outside it seems quite small but inside it is magnificent – the ceiling seems enormous, covered in stone carvings. After reading The Falls I wanted to see the Mason’s Pillar, the Apprentice Pillar and the carvings of maize over one of the windows (these were all clues to the cryptic questions in The Falls). The Pillars are eight feet high and are splendidly and elaborately carved. The legend goes that the Mason decided to go abroad to study the design for a pillar he’d been instructed to build and whilst he was away the Apprentice created the pillar having had a dream about how it should look. On the Master Mason’s return he was so enraged and jealous that he killed the Apprentice striking him with his mallet. And I did take a photo just before I went into the Chapel – for more photos see the Rosslyn Chapel website. Of course, I was interested in all the mystery surrounding the carvings and their meanings and whether there really was a link with the Knights Templar. The guide book indicates that there were in fact connections – the carvings of the five-pointed star, the dove in flight carrying an olive branch, the floriated cross and the artichoke are all said to have Templar associations. For me, though, it was the two pillars and the Biblical scenes that are the most striking, the crucifixion scenes and the images of death, particularly the series of figures each accompanied by a skeleton – known as the ‘dance of death’. The barrel-vaulted roof and stained glass windows are beautiful. I’ll have to go back for another visit one day, once I’ve read the guide book in more detail – one visit is just not enough. Today I’m in Edinburgh with DI Rebus investigating the disappearance of Philippa Balfour, a university student known as ‘Flip’ to her friends and family. She had arranged to meet friends at a bar on the South Side but hadn’t turned up. Her father is a wealthy banker living in The Falls where a carved wooden doll is found in a coffin shortly after Flip’s disappearance. Flip was involved in an Internet game involving solving cryptic clues – is this connected to her disappearance and who is the Quizmaster? Click the button to find out where other readers are today. 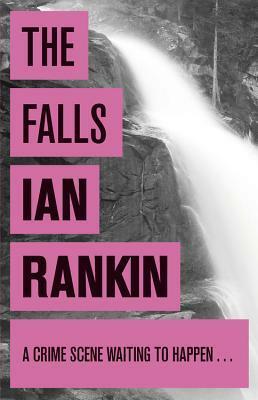 So my teaser this week is from page 280 of The Falls by Ian Rankin. For more teasers click the button.